The R/C Car Bible is written with the absolute R/C Car beginner in mind. Someone who has very little knowledge about the R/C Car hobby, but would love to learn and get involved with their first vehicle. 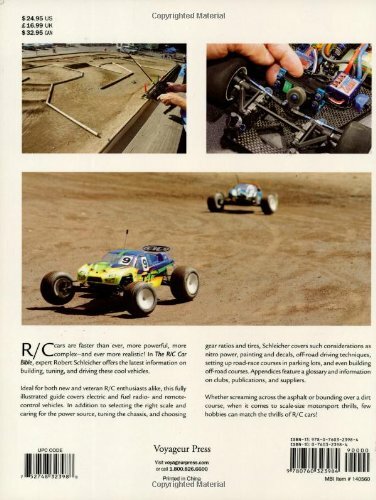 You have obviously been enticed into the world of R/C because of when it comes to scale-size motorsport thrills, few hobbies can match the unbridled thrills and spills of R/C cars. Whether you want to drift across the asphalt or go bounding over a dirt track kicking up dust and rocks, R/C cars offer you an ever-increasing level of power, detail, and sophistication to make you feel as though you are sitting in the drivers seat. 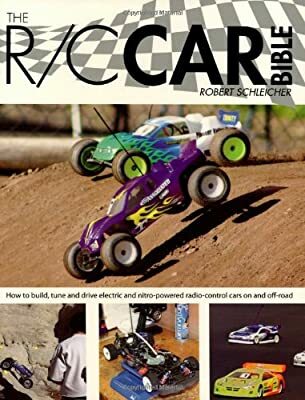 In this newbie friendly R/C manual, writer Robert Schleicher has offered a guide with detailed illustrations on both both electric and fuel remote-control vehicles. and even building off-road courses. One thing to keep in mind is that the information is a little dated considering a lot of the manuals have an edition date of 2006. That doesn't mean to say it won't help the newbie R/C enthusiast gain an understanding of all the necessary details that go into owning and running an R/C car. One example of the dated information is where Robert does a comparison between the power of an Electric R/Cs to Nitro R/Cs. It used to be true that Nitro were always faster and/or more powerful than Electric, but since the advent and development of Brushless Electric Motors it can be said that they perform just as well, and in some cases, much better than Nitro. That being said the information Robert provides is detailed and very helpful for any R/C newbie.